How to show off TeX skills with a TeX-typeset CV? Recently, I have been editing my CV, which is typeset with XeLaTeX. I realize that besides those trite TeX advantages, such as being neat and clean (and the TeX symbolic font of course), I am not displaying any TeX "guruness". My CV looks just the same as some others', who just picked up TeX yesterday and create their CV today! So I am thinking, what are the ways of showing off my TeX skills (if any). Since CV is usually required to be professional and clean, those fancy skills, such as drawing a Christmas tree, cannot be applied in the CV case. Suppose I have very rightful reasons and necessity to show off my TeX skills in my CV. What should I do? By the way, I am applying for graduate programs. 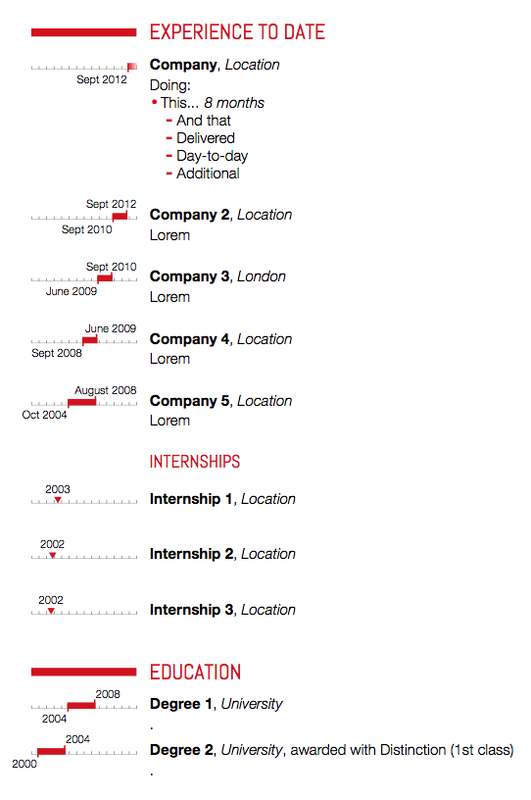 I liked the idea of a CV being, literally, a chronological order of events / experiences. So I spent some time modifying https://github.com/raphink/moderntimeline to do what I wanted; provide a Gantt chart-like narrative to the CV showing time and sequence in a single entity. This just builds on moderntimeline, adding tick marks for years, adjusting placements etc. All in tikz. I'm planning on issuing a pull request to moderntimeline to bring in some of my changes. 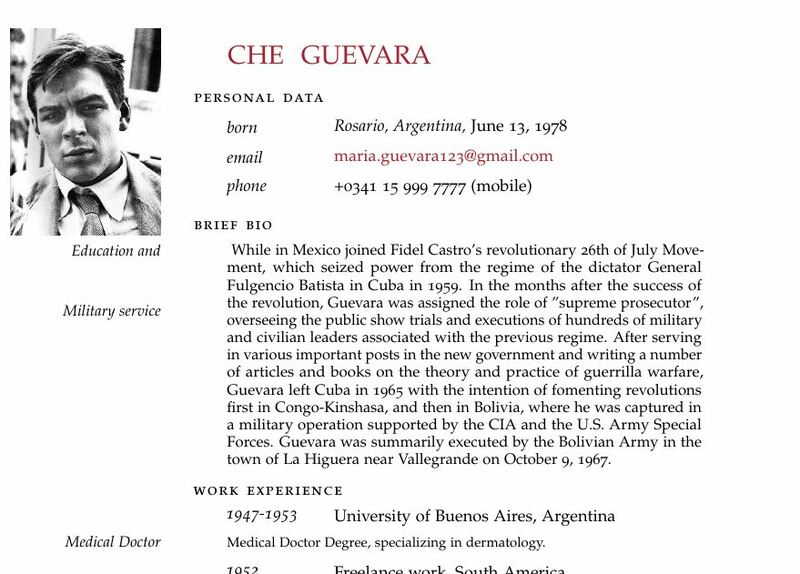 State your revolutionary skills in TeX or otherwise in words and have a nicely photoshopped photo. Use a nice blend of colours to match the photo. Wear a tie in the photo. Get a bit of humour in the text if you can..."was bored with the class and spend the evenings contributing to Open Source Projects..."
Add hyperlinks, mailto links, etc. This brings some interactivity in your cv. Use utf8-symbols for the phone, the mail, the webpage, etc. Chose them wisely and be consistent. Display a nice bibliography, if you have any publication. It is not that obvious : be consistent regarding the abbreviations, the chosen language, the name of the journals / conferences, add doi (with hyperlinks). This shows a rigor in the treatment of your .bib file. Be consistent and elegant with your margins. It is a typographic skill that is hard to transfer to LaTeX, and testify for your TeX skills. Use few colors and few fonts, and be confident with them. Maybe the most important : make a .tex file that is easy to update and portable. Do not re-do your CV every time you want to add/remove some information. The best TeX skill is in my opinion to be able to produce an elegant and sober document that do not show off, and that is easy to update and translate. Not the answer you're looking for? Browse other questions tagged moderncv fun or ask your own question. Moderncv with moderntimeline - how do I typeset positions that only lasted for one year? How can I make (some) $money$ out of my TeX skills? How do I turn on and off a bibliography? How to reduce name and title font in moderncv on TeX Live 2016? How to add information siding an image on a tex file powered by moderncv.cls file?